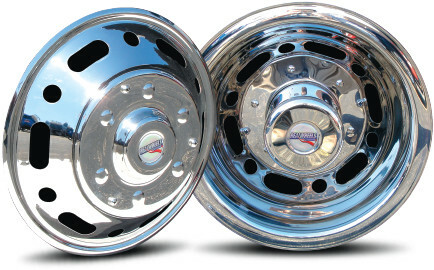 Set of 4 (2 front, 2 rear) Stainless Steel Wheel Simulators for 2007 - 2011 Sprinter 3500 models (dual rear wheels) with 16 inch wheels. Classic Style with lugs and hats. Made in USA. High-quality, non-magnetic 304L stainless steel ? will never rust, pit, corrode or turn yellow.